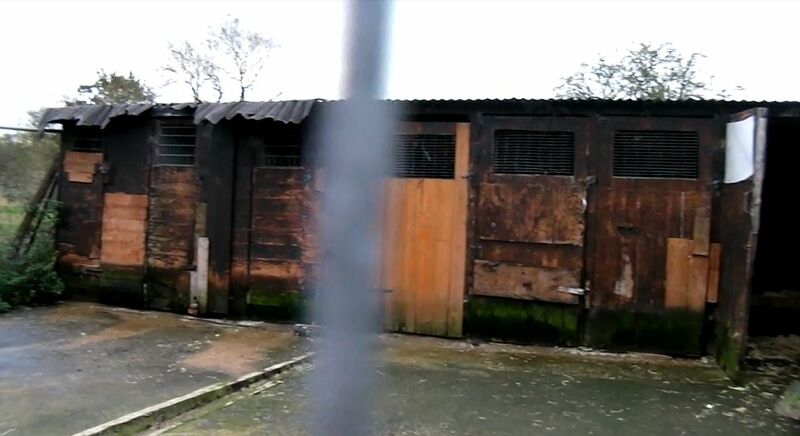 Following a lengthy investigation by Greyt Exploitations – Ted Jeory of the Sunday Express – has written an excellent article ‘Dog Kennels branded disgusting’ helping to expose the appalling conditions endured by racing greyhounds. The two ‘trainers’ investigated – Beverly Heaton and Nigel Saunders – are both contracted to supply dogs for the Bookmakers Afternoon Greyhound Service – BAGS – and also evening races at Belle Vue dog track in Manchester. Their kennels are inspected and licenced by the Greyhound Board of Great Britain to ensure they comply with the minimum standards set out under the Rules of Racing. BAGS meetings are held purely to transmit races to the betting shops and online for gambling purposes. The meetings are not attended by the public but supply 99% of the industry’s funding for the estimated £2.5 billion-a-year- greyhound industry. The kennels were monitored during October and November 2011 between the hours of 9am and dusk and on one occassion until 10 pm to observe activities when the trainer returned from the track. Investigators said there were only two kennelhands present at each property – finishing at 2pm and the dogs were only let out into either a small concrete compound or grass paddock for 10-15 minutes while the kennels were being cleaned. Investigators observed this poor retired girl – confined to a barren existence inside a concrete compound with no human contact except when given food. She was severely underweight – flea infested and looked pitiful – showing little interest in life outside her brick shed. Just one of the thousands of dogs the industry claim to keep in ‘retirement’ by their trainer. 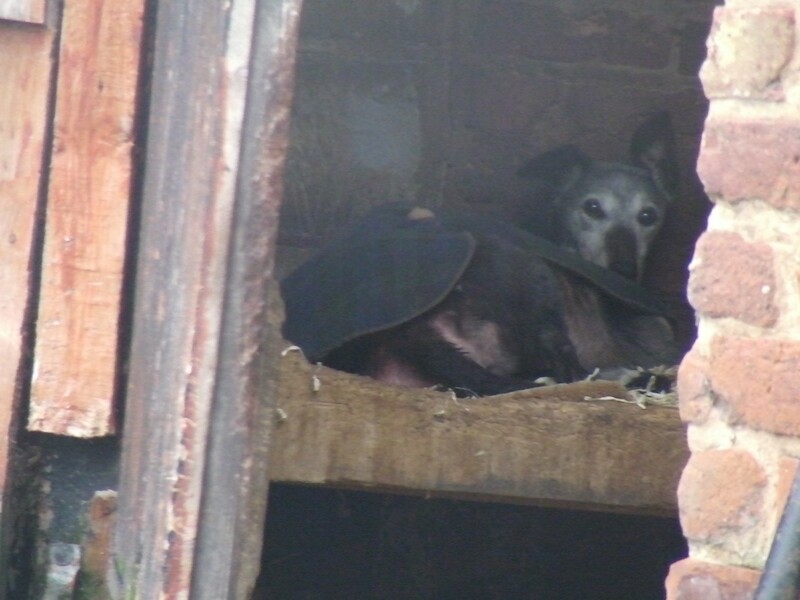 Many dogs were kept in unheated brick sheds with old corrugated tin sheeted roofs. Small squares cut out from the doors provided the dogs with their only source of natural light. These dogs were locked up for more than 23 hours a day – with little more than the sound of their own breath for comfort. The two large kennel blocks constructed of brick and corrugated asbestos/tin sheeting – had little means of natural light. In one block there were just a few skylights and although the second block had two large windows – they were blacked out from the inside. The electric lights were only turned on for cleaning and the kennelling of dogs returning from the tracks – leaving the dogs in virtual darkness for most of the day. Poorly constructed and maintained – hazardous sharp wire and clawed/gnawed wood were the conditions afforded in return for the thousands of pounds profit each dog individually generates for the bookmakers. There was no evidence of heating or mechanical ventilation and the dogs clearly suffered in the urine soaked atmosphere that investigators said they could smell from a distance of at least 30 foot from the kennels. On the perimeter of the property – dog faeces and soled bedding had been dumped over what must have been many many years – resulting in a huge mound of toxic waste – a serious breach of environmental legislation. Again – investigators said the smell discharging from the mass of waste was putrid. Distressingly – a greyhound skull with extensive dental plaque – together with vertebrae – scapular and leg bones were found by investigators at the base of the dumped faeces and soiled bedding. Dogs were kept in shoddily built tin shelters or Air Europe cargo containers – with no doors and blue plastic food containers were used as beds for the dogs. While other shelters were made of brick – they had no doors or visible signs of bedding – leaving one poor dog seeking comfort of the cold damp grass to sleep on. The small muddy paddocks were littered with faeces and reeked of urine. Although a kennel block had been freshly painted – the walls were stained with penetrating damp and water leaking from the roof. Most dogs had to share a bed barely big enough for one and Dacent Alonso was muzzled even though he was kennelled alone. By Mrs Heaton’s own admission – these dogs were kennelled for just under 23 hours a day. Faeces – soiled bedding – commercial and household wastes were burnt on a large bonfire – in breach of environmental legislation. An official complaint will be submitted to the Greyhound Board of Great Britain regarding their persistent failure to regulate and enforce their own Rules of Racing – that results in the inhumane treatment of dogs and the contamination of the environment. Please help seek lawful protection for racing greyhounds by writing to the Government.